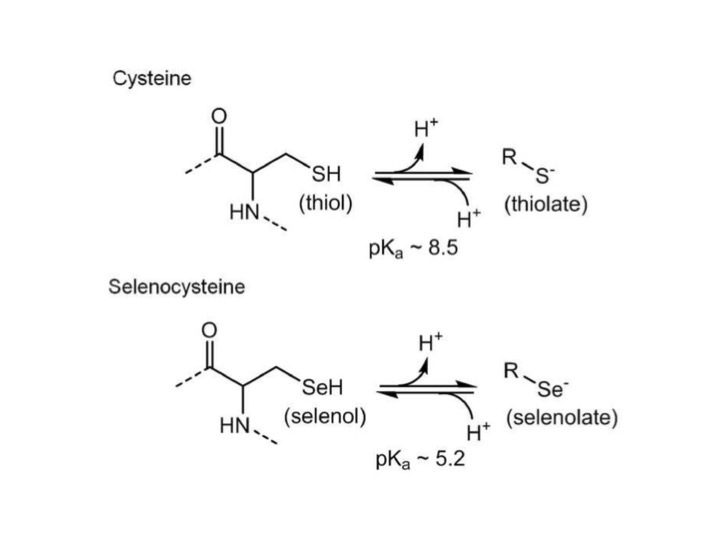 Proteins with cysteine amino acid residues contain thiol (SH) groups, and proteins with selenocysteine amino acid residues contain selenol (SeH) are characterized as cysteine-/selenoprotein family. Thiol and selenol groups exhibit reactivity toward electrophiles and oxidants and have high binding affinities for metals (Higdon, 2012; Nagy, 2013; Winterbourn, 2008; Winther, 2014). Figure 1. (Poole, 2015) Structures of cysteinyl and selenocysteinyl residues within proteins. The aminoacyl groups are shown to the left, with dotted lines representing peptide bonds to the next residue on either side. Both protonated (left) and deprotonated (right) forms of these amino acids are depicted with average pKa values. The selenoprotein family composes of proteins with diverse functionality, however, several are classified as antioxidant enzymes (Reeves, 2009) and this function is of particular importance for this KER. Relevant for this KER there are two well-studied functional selenoprotein families which are described to be expressed in the brain; (i) the Glutathione Peroxidase (GPx) family, involved in detoxification of peroxidases; (ii) the Thioredoxin Reductase (TrxR) family, which is involved in the regeneration of reduced thioredoxin (Pillai, 2014). However, there is also a number of other selenoproteins with diverse functions, from selenium transport (SelP), to ER stress response (SelK, M, N, S, T and Sep15, as well as DIO2) (Pisoschi, 2015; Reeves, 2009). Due to their described functionalities (summarized in table below) an increased oxidative stress as a consequence of interference with selenoprotein function, through binding to active-site thiol-/selenol groups will primarily concern the interference with proteins of the GPx- and TrxR families, as well as SelH, K, S, R, W, and P selenoproteins. GSH is a major endogenous antioxidant functioning directly in neutralization of free radicals and reactive oxygen compounds. GSH is the reduced form of glutathione and its SH group of cysteine is able to reduce and/or maintain reduced form of other molecules. Disruptions leads to increased oxidative stress and apoptosis. (Promotes neuroprotection in response to oxidative challenge). Brain expression levels are highest in microglia and lower levels detected in neurons. Brains of GPx1−/− mice are more vulnerable to mitochondrial toxin treatment, ischemia/ reperfusion, and cold-induced brain injury. Cultured neurons from GPx1−/− mice were reported to be more susceptible to Aβ-induced oxidative stress, and addition of ebselen reversed this. Only in neurons during normal conditions. Brains of GPx4+/− mice were shown to have increased lipid peroxidation (a sign of oxidative stress). Injury-induced GPx4 expression in astrocytes. In vivo over expression of GPx4 protects against oxidative stress-induced apoptosis. TrxR-1 regulates the induction of the antioxidant enzyme heme oxygenase 1 (HO-1). Overexpression of human Trx1 and Trx2 protects retinal ganglion cells against oxidative stress-induced neurodegeneration. Hypersensitivity of SelH shRNA HeLa cells to paraquat- and H2O2-induced oxidative stress. localized to the ER membrane. ER homeostasis and oxidative stress response. Protects HepG2 cells from ER stress agent-induced apoptosis. localized to the ER membrane. Catalyze the reduction of disulfide bonds and peroxides. SelS overexpression increased astrocyte resistance to ER-stress and inflammatory stimuli, and suppression of SelS compromised astrocyte viability. Function in reduction of oxidized methionine residues, and actin polymerization. Induce expression of MSRB1 protects neurons from amyloid β-protein insults in vitro and in vivo. Expressed in synapses. Plays an antioxidant role in cells. Rat in vivo overexpression of SelW was shown to protect glial cells against oxidative stress caused by heavy metals and 2,20-Azobis. Silencing of SelW made neurons more sensitive to oxidative stress. Is important for selenium transport, distribution and retention within the brain. Acts as a ROS-detoxifying enzyme. Protects human astrocytes from induced oxidative. SelP-/- mice show neurological dysfunction and that Se content and GPx activity were reduced within brain, Se supplementation to diet attenuated. neurological dysfunctions. Binding to thiol/sulfhydyryl groups of these proteins can firstly result in structural modifications of these proteins, which in turn negatively effects the catalytic capacity and thereby reducing or blocking the metabolic capacity to neutralize reactive oxygen species (Fernandes, 1996; Rajanna, 1995), secondly, SH/SeH binding would also the instrinsic primary antioxidant functionalities of selenoproteins (Kohen, 2002; Pisoschi, 2015). Primary antioxidants are mainly chain breakers, able to scavenge radical species by hydrogen donation. Secondary antioxidants are singlet oxygen quenchers, peroxide decomposers, metal chelators, oxidative enzyme inhibitors (Pisosci and Pop 2015). Thiol- and selenol containing proteins have a high affinity for binding soft metals which contributes to the target site – brain – distribution of such toxicants (Farina, 2011). The thioredoxin reductase (TxRs) family of selenoproteins are homodimeric flavoenzymes, which mediate the reduction of oxidized Txn at the expense of NADPH (Birben et al., 2012). Inhibition of TrxR enzymes have been shown to lead to oxidative stress (Carvalho, 2008). The selenol group (-SeH) of selenocysteines is generally more reactive than thiols (-SH) towards mercury (Sugiura 1976, Khan, 2009). Methyl mercury (MeHg) can target both the GPx and TrxR proteins thereby causing induction of oxidative stress and neurotoxicity (Branco, 2017; Carvalho, 2008; Farina, 2011). No literature supporting the link “SH/she binding leads to oxidative stress” for acrylamide as stressor in brain/neural tissue can be found. No literature supporting the link “SH/she binding leads to oxidative stress” for acrolein as stressor in brain/neural tissue can be found. Methylmercury cytotoxicity in PC12 cells is mediated by primary glutathione depletion independent of excess reactive oxygen species generation (Gatti et al., 2004). Mechanistic support for the link between interference of SH/SeH groups of proteins and induction of oxidative stress can be found in Zebrafish, rodents (mouse and rat) and to some extent in man (see Table 2). Arbogast, S. and A. Ferreiro (2010). "Selenoproteins and protection against oxidative stress: selenoprotein N as a novel player at the crossroads of redox signaling and calcium homeostasis." Antioxid Redox Signal 12(7): 893-904. Arbogast, S., M. Beuvin, B. Fraysse, H. Zhou, F. Muntoni and A. Ferreiro (2009). "Oxidative stress in SEPN1-related myopathy: from pathophysiology to treatment." Ann Neurol 65(6): 677-686. Aschner, M., T. Syversen, D. O. Souza and J. B. Rocha (2006). "Metallothioneins: mercury species-specific induction and their potential role in attenuating neurotoxicity." Exp Biol Med (Maywood) 231(9): 1468-1473. Borchert, A., C. C. Wang, C. Ufer, H. Schiebel, N. E. Savaskan and H. Kuhn (2006). "The role of phospholipid hydroperoxide glutathione peroxidase isoforms in murine embryogenesis." J Biol Chem 281(28): 19655-19664. Burk, R. F., G. E. Olson, K. E. Hill, V. P. Winfrey, A. K. Motley and S. Kurokawa (2013). "Maternal-fetal transfer of selenium in the mouse." FASEB J 27(8): 3249-3256. Byrns, C. N., M. W. Pitts, C. A. Gilman, A. C. Hashimoto and M. J. Berry (2014). "Mice lacking selenoprotein P and selenocysteine lyase exhibit severe neurological dysfunction, neurodegeneration, and audiogenic seizures." J Biol Chem 289(14): 9662-9674. Caballero, B., N. Olguin, F. Campos, M. Farina, F. Ballester, M. J. Lopez-Espinosa, S. Llop, E. Rodriguez-Farre and C. Sunol (2017). "Methylmercury-induced developmental toxicity is associated with oxidative stress and cofilin phosphorylation. Cellular and human studies." Neurotoxicology 59: 197-209. Cabungcal, J. H., D. Nicolas, R. Kraftsik, M. Cuenod, K. Q. Do and J. P. Hornung (2006). "Glutathione deficit during development induces anomalies in the rat anterior cingulate GABAergic neurons: Relevance to schizophrenia." Neurobiol Dis 22(3): 624-637. Carvalho, C. M., E. H. Chew, S. I. Hashemy, J. Lu and A. Holmgren (2008). "Inhibition of the human thioredoxin system. A molecular mechanism of mercury toxicity." J Biol Chem 283(18): 11913-11923. Chen, L., R. Na, M. Gu, A. Richardson and Q. Ran (2008). "Lipid peroxidation up-regulates BACE1 expression in vivo: a possible early event of amyloidogenesis in Alzheimer's disease." J Neurochem 107(1): 197-207. Crack, P. J., J. M. Taylor, N. J. Flentjar, J. de Haan, P. Hertzog, R. C. Iannello and I. Kola (2001). "Increased infarct size and exacerbated apoptosis in the glutathione peroxidase-1 (Gpx-1) knockout mouse brain in response to ischemia/reperfusion injury." J Neurochem 78(6): 1389-1399. Crack, P. J., K. Cimdins, U. Ali, P. J. Hertzog and R. C. Iannello (2006). "Lack of glutathione peroxidase-1 exacerbates Abeta-mediated neurotoxicity in cortical neurons." J Neural Transm (Vienna) 113(5): 645-657. Deepmala, J., M. Deepak, S. Srivastav, S. Sangeeta, S. A. Kumar and S. S. Kumar (2013). "Protective effect of combined therapy with dithiothreitol, zinc and selenium protects acute mercury induced oxidative injury in rats." J Trace Elem Med Biol 27(3): 249-256. Dringen, R. (2000). "Metabolism and functions of glutathione in brain." Prog Neurobiol 62(6): 649-671. Du, S., J. Zhou, Y. Jia and K. Huang (2010). "SelK is a novel ER stress-regulated protein and protects HepG2 cells from ER stress agent-induced apoptosis." Arch Biochem Biophys 502(2): 137-143. Farina, M., F. Campos, I. Vendrell, J. Berenguer, M. Barzi, S. Pons and C. Sunol (2009). "Probucol increases glutathione peroxidase-1 activity and displays long-lasting protection against methylmercury toxicity in cerebellar granule cells." Toxicol Sci 112(2): 416-426. Farina, M., M. Aschner and J. B. Rocha (2011). "Oxidative stress in MeHg-induced neurotoxicity." Toxicol Appl Pharmacol 256(3): 405-417. Fernandes, A. C., P. M. Filipe, J. P. Freitas and C. F. Manso (1996). "Different effects of thiol and nonthiol ace inhibitors on copper-induced lipid and protein oxidative modification." Free Radic Biol Med 20(4): 507-514. Ferreiro, A., S. Quijano-Roy, C. Pichereau, B. Moghadaszadeh, N. Goemans, C. Bonnemann, H. Jungbluth, V. Straub, M. Villanova, J. P. Leroy, N. B. Romero, J. J. Martin, F. Muntoni, T. Voit, B. Estournet, P. Richard, M. Fardeau and P. Guicheney (2002). "Mutations of the selenoprotein N gene, which is implicated in rigid spine muscular dystrophy, cause the classical phenotype of multiminicore disease: reassessing the nosology of early-onset myopathies." Am J Hum Genet 71(4): 739-749. Flentjar, N. J., P. J. Crack, R. Boyd, M. Malin, J. B. de Haan, P. Hertzog, I. Kola and R. Iannello (2002). "Mice lacking glutathione peroxidase-1 activity show increased TUNEL staining and an accelerated inflammatory response in brain following a cold-induced injury." Exp Neurol 177(1): 9-20. Fradejas, N., C. Serrano-Perez Mdel, P. Tranque and S. Calvo (2011). "Selenoprotein S expression in reactive astrocytes following brain injury." Glia 59(6): 959-972. Fradejas, N., M. D. Pastor, S. Mora-Lee, P. Tranque and S. Calvo (2008). "SEPS1 gene is activated during astrocyte ischemia and shows prominent antiapoptotic effects." J Mol Neurosci 35(3): 259-265. Franco JL, Teixeira A, Meotti FC, Ribas CM, Stringari J, Garcia Pomblum SC, Moro AM, Bohrer D, Bairros AV, Dafre AL, et al: Cerebellar thiol status and motor deficit after lactational exposure to methylmercury. Environ Res 2006, 102:22-28. Gao, Y., J. Pagnon, H. C. Feng, N. Konstantopolous, J. B. Jowett, K. Walder and G. R. Collier (2007). "Secretion of the glucose-regulated selenoprotein SEPS1 from hepatoma cells." Biochem Biophys Res Commun 356(3): 636-641. Gatti, R., Belletti, S., Uggeri, J., Vettori, M.V., Mutti, A., Scandroglio, R., Orlandini, G. Methylmercury cytotoxicity in PC12 cells is mediated by primary glutathione depletion independent of excess reactive oxygen species generation (2004) Toxicology, 204 (2-3), pp. 175-185. Gladyshev, V. N., K. T. Jeang and T. C. Stadtman (1996). "Selenocysteine, identified as the penultimate C-terminal residue in human T-cell thioredoxin reductase, corresponds to TGA in the human placental gene." Proc Natl Acad Sci U S A 93(12): 6146-6151. Hall, A. G. (1999). "Review: The role of glutathione in the regulation of apoptosis." Eur J Clin Invest 29(3): 238-245. Hanschmann, E. M., J. R. Godoy, C. Berndt, C. Hudemann and C. H. Lillig (2013). "Thioredoxins, glutaredoxins, and peroxiredoxins--molecular mechanisms and health significance: from cofactors to antioxidants to redox signaling." Antioxid Redox Signal 19(13): 1539-1605. Hattori, I., Y. Takagi, H. Nakamura, K. Nozaki, J. Bai, N. Kondo, T. Sugino, M. Nishimura, N. Hashimoto and J. Yodoi (2004). "Intravenous administration of thioredoxin decreases brain damage following transient focal cerebral ischemia in mice." Antioxid Redox Signal 6(1): 81-87. Higdon, A., A. R. Diers, J. Y. Oh, A. Landar and V. M. Darley-Usmar (2012). "Cell signalling by reactive lipid species: new concepts and molecular mechanisms." Biochem J 442(3): 453-464. Hill, K. E., J. Zhou, W. J. McMahan, A. K. Motley and R. F. Burk (2004). "Neurological dysfunction occurs in mice with targeted deletion of the selenoprotein P gene." J Nutr 134(1): 157-161. Hill, K. E., J. Zhou, W. J. McMahan, A. K. Motley, J. F. Atkins, R. F. Gesteland and R. F. Burk (2003). "Deletion of selenoprotein P alters distribution of selenium in the mouse." J Biol Chem 278(16): 13640-13646. Khan, M. A. and F. Wang (2009). "Mercury-selenium compounds and their toxicological significance: toward a molecular understanding of the mercury-selenium antagonism." Environ Toxicol Chem 28(8): 1567-1577. Klivenyi, P., O. A. Andreassen, R. J. Ferrante, A. Dedeoglu, G. Mueller, E. Lancelot, M. Bogdanov, J. K. Andersen, D. Jiang and M. F. Beal (2000). "Mice deficient in cellular glutathione peroxidase show increased vulnerability to malonate, 3-nitropropionic acid, and 1-methyl-4-phenyl-1,2,5,6-tetrahydropyridine." J Neurosci 20(1): 1-7. Kohen, R. and A. Nyska (2002). "Oxidation of biological systems: oxidative stress phenomena, antioxidants, redox reactions, and methods for their quantification." Toxicol Pathol 30(6): 620-650. Labunskyy, V. M., D. L. Hatfield and V. N. Gladyshev (2014). "Selenoproteins: molecular pathways and physiological roles." Physiol Rev 94(3): 739-777. Lee, B. C., Z. Peterfi, F. W. Hoffmann, R. E. Moore, A. Kaya, A. Avanesov, L. Tarrago, Y. Zhou, E. Weerapana, D. E. Fomenko, P. R. Hoffmann and V. N. Gladyshev (2013). "MsrB1 and MICALs regulate actin assembly and macrophage function via reversible stereoselective methionine oxidation." Mol Cell 51(3): 397-404. Lindenau, J., H. Noack, K. Asayama and G. Wolf (1998). "Enhanced cellular glutathione peroxidase immunoreactivity in activated astrocytes and in microglia during excitotoxin induced neurodegeneration." Glia 24(2): 252-256.